The Highland Lakes now has another spot on its mountain biking “trail,” and this one includes a lift. Spider Mountain Bike Park, located on the shores of Lake Buchanan, opens Friday, Feb. 8. It’s the only year-round lift-served bike park in the United States. The park features beginner, intermediate, and advanced trails. Riders can access the trails via four-person chairlift. 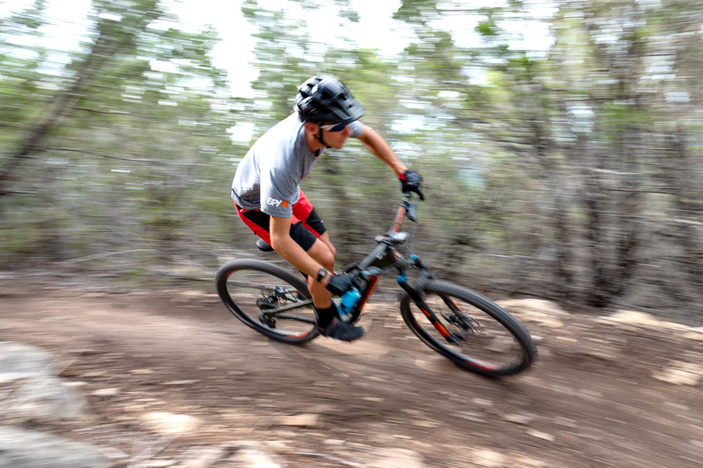 The park, which operates 9 a.m.-5 p.m. Friday-Sunday, also offers mountain bike and gear rentals. There will possibly be additional hours and days during Spring Break and on holidays. Spider Mountain, with a 350-foot elevation decline, features downhill flow trails and technical trails with bridges, berms, jumps, and more. Hogan Koesis designed and developed the course. He is the director of mountain biking for Mountain Capital Partners, which owns and operates Spider Mountain as well as six ski resorts. He has more than a decade of experience in the biking industry designing, developing, and constructing trails. Lift tickets are $50 for ages 19-59 and $45 for all others. An introductory Spider Mountain Season Pass, valid through April 30, 2019, will be $199 for ages 19-59 years and $149 everyone else. Power Pass holders also have mountain biking privileges at Spider Mountain in addition to skiing and snowboarding in four different states. Power Cards and Power Packs may also be used at the bike park. Spider Mountain also offers scenic chairlift rides for $20 per adult and $15 for all others. They’re free for kids ages 3 and younger. Mountain Capital Partners also acquired Thunderbird Lodge and Event Center, located adjacent to the new bike park, and will continue to operate the facility, which includes 23 units. Thunderbird Lodge offers swimming, fishing, fishing guides, boat rentals, a 15-slip marina with gas, a boat launch, and more. Spider Mountain Bike Park is located at 200 Greenwood Trails just off FM 2341 between Council Creek and Silver Creek in western Burnet County. Go to spidermountain.com for more information.